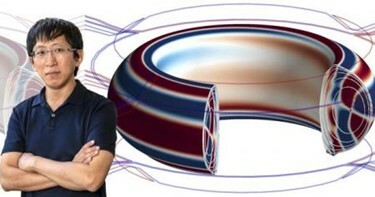 Physicist Jong-Kyu Park with diagram showing the beneficial magnetic distortion as color-shaded regions on the smooth doughnut-shaped surface of the KSTAR plasma, together with the external 3D field coils used to generate the distortion. Photo by Elle Starkman, diagram by Jong-Kyu Park. PPPL, on Princeton University's Forrestal Campus in Plainsboro, N.J., is devoted to creating new knowledge about the physics of plasmas — ultra-hot, charged gases — and to developing practical solutions for the creation of fusion energy. The Laboratory is managed by the University for the U.S. Department of Energy’s Office of Science, which is the largest single supporter of basic research in the physical sciences in the United States, and is working to address some of the most pressing challenges of our time. For more information, visit science.energy.gov.